Mow when your grass is dry. Mowing when it’s wet isn’t harmful, but it isn’t ideal. If you do mow wet grass, slow down your walking speed as the mower can clog easily and carefully remove any large clumps once you’ve shut the mower off. Adjust your deck height. Scalping (cutting it too short) is the #1 contributor to weed growth. 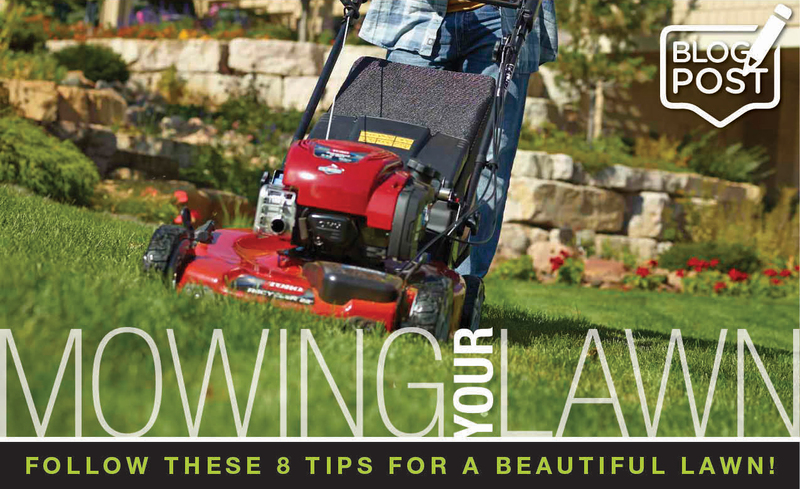 As a rule of thumb, you don’t want to mow more than 1/3 of your grass height at a time. This will help you avoid scalping and will reduce stress on your grass. Sharpen your mower blade. A sharp blade will cut grass cleanly, instead of tearing it. If your grass is looking frayed, it’s probably time to bring your mower into Kooy Brothers so we can sharpen your blade. Don’t look down! Focus on something straight ahead of you to ensure you have the straightest lines, making sure you slightly overlap your previous line with the wheels of the mower. Change it up. Mow in a different direction each time you mow. Mowing in the same direction can encourage compacting soil and create ruts which promotes the growth of weeds. Grass leans in the direction you mow it, switching direction encourages the grass to grow straighter and healthier. Mow in the shade. Mowing causes stress on the grass (just as pruning causes stress on a plant). Mowing in the heat of the day causes grass to lose more water making it slower to rebound. Skip the bagging and mulch it. Mulching cycles the grass through your mower deck chopping it up really fine, then shoots the cut grass back to the ground. Grass clippings can provide up to 25% of your lawns fertilizer needs. Not to mention, you save some money on grass bags, fertilizer and time on bagging the clippings. Mulching is not recommended if you have weeds that are seeding. In this case, you should bag your clippings to prevent them from spreading. Don’t forget to clean up. Clumps of wet grass can sometimes get stuck against your mower deck and blade, which is the perfect condition for rust to build up. To avoid rust, make sure you clean your mower when you’re done. Most new mowers are equipped with washout ports, allowing you to attach the garden hose directly to the mower for quick, easy grass removal.